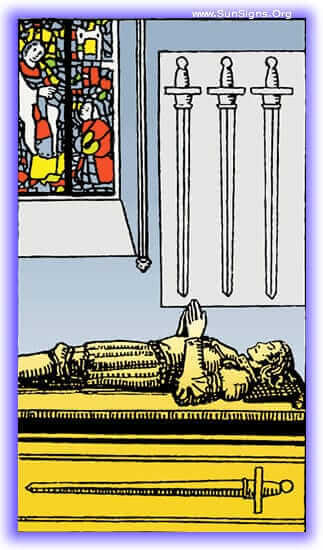 The Four of Swords tarot card represents a knight lay in repose, a sword alongside him, and three hang above him, representing challenges past. 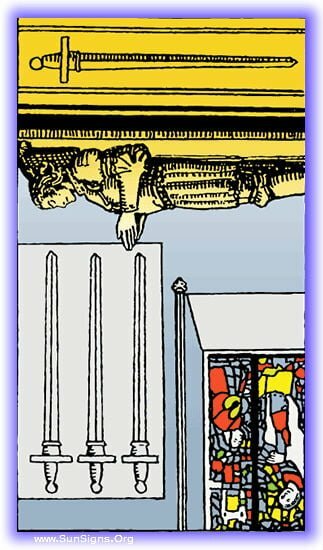 This stage in the Minor Arcana represents challenges having gone before, and a time of rest and meditation being upon you. There are portents of challenges to come, this is a reprieve, not a cessation. This is an indication that you need time for rest and recuperation to prepare for the coming storm. You have successfully overcome the challenges that have been placed before you, and entered a time of rest. Wars are not fought in a single battle, they are fought in a series of waves. After coming over a crest, it is time to recover in the valley between so you can have the resilience to move forward. After having overcome many challenges, you have been enjoying a break. That time is over, and the forces that stand against you have been taking this time to marshal against you. This tarot card being in your past means it’s time to don your armor, draw your sword, and prepare for battle. Take your ease soldier, the battle is seeing a lull. This quiet time is not a trick, not a lie, but nor is it the end of the war. Take time to meditate on what you’ve learned and what you’ve seen, and take what lessons from it you can before it’s time to draw your sword and charge in again. This card being in your future means your present troubles are at an end. You’ve been embroiled in a long and wearing battle, and you’ve been handling these situations successfully. Carry on, a break is coming. The peril of constant vigilance is exhaustion. When the Four of Swords arrives in your tarot reading it indicates that you’re trying to do too many things at once, and are not recognizing that you will break under the strain. It is time to rest and confront the damage you’ve taken throughout your battles, tend your wounds, so that you can continue to move forward. Sometimes this also represents stagnation, being overcome by the challenges you’ve faced. Your exhaustion is wearing on you soldier, it’s taking it’s toll and if you continue to fight without cessation you will break under the strain. This card represents the continuous strain of the battle you’ve been fighting, and the strain it’s been putting on you. Is it all too much, but does it also all need to be done? If this is how you feel, this card is playing prominently in your current circumstances. It is a warning that you’re overdoing it, and taking on more than you can bear. For all the things that need to be handled, if you don’t take time to tend to yourself, you’re going to collapse under the strain and none of it will get done. The battle wages on my friend, enemies on every side. You have fortified the hold, dug the trenches, and faced off against every enemy. More are coming, and the only thing you will think is “I can persevere”. This card in your future indicates that while you have the strength to continue now, if you don’t start taking care of yourself immediately, you will collapse under the strain in the near future. A broken soldier is no good to anyone.